Situated on the Rimrocks overlooking the city, Billings Logan International Airport is Montana's largest and busiest airport. The service area includes the Western Dakotas, Eastern Montana, and Northern Wyoming. Scheduled passenger airline service is provided by Delta Air Lines, United Air Lines, Allegiant Air, Alaksa Air, and Cape Air with daily non-stop service to Denver, Minneapolis, Salt Lake City, Seattle, and Portland, weekly non-stop service to Mesa/Phoenix, and Las Vegas, and seasonal non-stop service to Chicago, Atlanta, and Los Angeles. Cape Air utilizes the Billings Logan International Airport as its hub for Essential Air Service operations to five Eastern Montana locations. The airlines provide between 25 and 34 passenger departing flights per day depending on the time of year. Edwards Jet Center, a general aviation Fixed Base Operator (FBO), is located at Billings Logan International Airport providing aircraft fueling, parts, repairs, air charter service, and other customer services. Passenger services available at Billings Logan International Airport include car rentals, a fine dining restaurant/lounge and a concourse deli, gift shop, information booth, ATM, pay phones, and pay per use Wi-Fi Internet. In addition, there are play areas for those traveling with children. Short and long-term public parking is conveniently located in front of the Terminal Building. Skycaps, employed by the Airport, are available to assist you with your luggage. Carts are also available to assist you with transporting bags and packages. The cart units are located in the baggage and ticketing areas. The Yellowstone County Museum is located across from the Terminal Building (a short walk) and overlooks downtown Billings. Wildlife mounts and historical artifacts are displayed in a western setting of the Museum's historic log cabin. 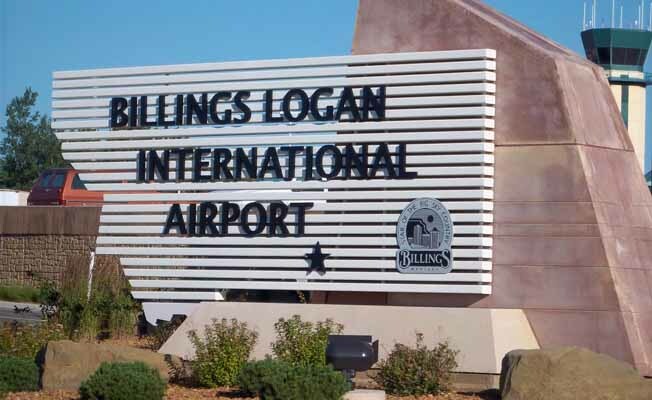 Billings Logan International Airport is located at the intersection of State Highway 3 from the west, North 27th Street from the south, and Airport Road (secondary State Route 318) from the east. From Interstate 90, take the 27th Street exit. Stay on North 27th Street and proceed north to the top of the hill.Billings Logan International Airport is located at the intersection of State Highway 3 from the west, North 27th Street from the south, and Airport Road (secondary State Route 318) from the east. From Interstate 90, take the 27th Street exit. Stay on North 27th Street and proceed north to the top of the hill.